The HS34 is a D10/D100 series optional expansion module that extends the HSI function already built into and displayed on Dynon’s D10, D100, and D180 EFISs. This panel-mounted device not only expands the HSI functionality but also enables several new features for the Dynon EFIS, EMS or FlightDEK instrument to which it is networked.The HS34 is available in vertical and horizontal panel mount configurations. The expansion module concept provides exceptional value and performance while preserving the affordability of Dynon’s existing equipment. This modular approach offers greater flexibility when configuring new aircraft panel systems and facilitates future expansion if so desired. While all of Dynon's EFIS instruments currently include HSI functionality, full compatibility with some GPS and NAV radios have been limited by the serial connection method. The HS34 overcomes these restraints by adding ARINC-429 and serial interfaces to cover many popular radios. 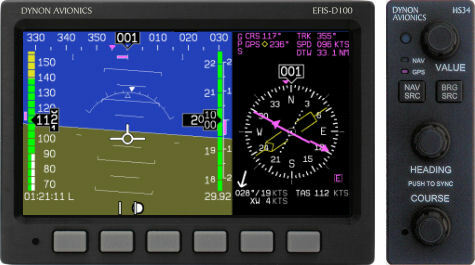 With the addition of an HS34 to an EFIS, full compatibility is now possible with radios such as the Garmin 430/530. This includes advanced features IFR pilots demand, such as CDI auto-scaling and full vertical guidance information from WAAS-enabled units. The HS34 effectively eliminates the need to install a conventional CDI/GS head. The HS34 expansion module is network connected via the Dynon Smart Avionics Bus (DSAB). This two-wire connection not only simplifies wiring but extends individual module benefits to multiple interconnected Dynon instruments. The HS34 is supplied with a mounting bracket and two mating connectors with pins. The HS34 is compatible with NAV radios using the industry-standard ARINC-429 outputs. It's also compatible with Navigation GPSs with either ARINC-429 or RS-232 serial output streaming either NMEA-0183 or Aviation format. The HS34 requires that you have at least an EFIS-D10A, EFIS-D100 or FlightDEK-D180 installed in your plane. Below is the list of devices that have been successfully tested with the HS34.